Collingwood will take on the recently departed Dayne Beams and his new Brisbane teammates in the first round of the 2015 season. The trade period is over, and now the news outlets review each club's performance after the completion of 24 trades. Dayne Beams may have to remain a Magpie for at least another season if the Brisbane Lions can't offer adequate compensation. Everything old is suddenly new again, as Beams returns to Collingwood after four years with Brisbane. The Queenslander returned to Melbourne during the October Trade Period of 2018 off the back of a sensational season in which he polled 18 Brownlow Medal votes. In his first incarnation as a Magpie, Beams had collected a premiership medallion and a Copeland Trophy before his 23rd birthday. He quickly proved a bargain buy at selection No. 29 in the 2008 National Draft, slipping seamlessly into the senior side in round two of the following season and rarely skipping a beat thereafter. His best football saw him average 30 disposals and a goal per game in 2012, and only injuries got in his way in the year that followed. The tattooed on-baller is skillful around the packs where his hardness and no-fuss approach means he can win the contested ball, but he is also effective in attack where his ability to sniff out a major saw average nearly a goal per game in his first 167 outings. Beams enjoyed a marvelous season, polling 18 Brownlow Medal votes in 21 games and averaging 29.1 disposals, his highest return since his Copeland Trophy winning season of 2012. As ever, his best was scintillating, highlighted by his five goals and 32 disposals in a loss to North Melbourne mid-season (an effort which, remarkably, went without a Brownlow vote). 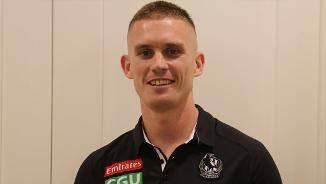 At year’s end, Beams sought a trade back to Collingwood, a deal that saw Brisbane receive picks 18 and 56 in this year's national draft and the Magpies’ 2019 first-round pick. Elevated to the captaincy, Beams had a stellar season. After 18 months cruelled by shoulder and knee injuries, he was back to his ball-winning best, finishing second in the best-and-fairest and top 10 in the Brownlow Medal. He averaged 27 disposals and kicked 20 goals in his 19 games, including a memorable 32-touch, four-goal output against Gold Coast in round 21. He played the final eight games carrying a shoulder injury that required surgery. The best player on the Lions’ list endured a year he would rather forget after shoulder surgery finished his 2015 campaign prematurely and knee surgery restricted him to just two games in 2016. Beams had a knee tendon issue that kept him out of the first six games, and when he returned against Port Adelaide in round seven, he showed his class immediately with 30 touches and one goal. But one game later, against his former club Collingwood, he was out again, requiring knee surgery. He was a chance to play late in the year, but the Lions took a conservative approach. The former Collingwood premiership player could not have done much more in his first 16 games for the Lions, averaging 28 disposals (13 contested) and 6.5 clearances to be among the top 12 in the AFL in each category. At times, he almost single-handedly carried the injury-depleted midfield and, after playing with a right shoulder injury in his last few matches, was forced to undergo surgery late in the season. Beams was a deserving best-and-fairest winner. 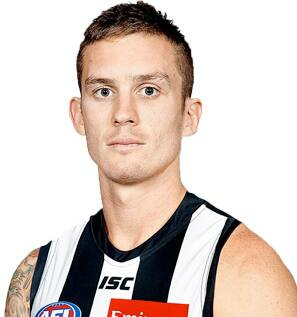 Beams enjoyed another terrific year at Collingwood, averaging 27 disposals and kicking 23 goals in his 19 games. He is a damaging midfielder who can win the contested ball, but does his best work in space where he can use his laser-like right foot to hit teammates or kick goals. He was traded to Brisbane at the end of the season as part of a deal that saw Jack Crisp and pick No. 5 (Jordan De Goey) end up at Collingwood. Arguably the biggest signing by the Lions since Leigh Matthews came on board as coach in 1999, Beams is an A-grade midfielder in his prime. An awfully frustrating campaign for one of the competition’s premier onballers. Beams entered 2013 with the football world at his feet after claiming his first Copeland Trophy and All-Australian gongs the previous October. His start to the NAB Cup (42 possessions and nine clearances across three games) suggested that he was set to continue his winning ways, but a torn quad during the team’s final training session before round one ruined his season. He was seemingly forever only 1-2 weeks away from a return that had to wait until 6 July. Beams quickly showed that he was keen to make up for lost time, collecting 28 possessions and eight clearances as well as kicking the match winning goal against Box Hill in round 13 of the VFL. The match committee acted quickly, calling him up for the senior match against Adelaide six days later. He got the wheels ticking over with 25 possessions and four tackles before putting the foot down with 34 and 37 possessions against the two expansion clubs in the fortnight that followed. His form remained consistent in the lead up to September though he was laid low by back stiffness in round 22. He signed off on a frustrating year with an equal team high 29 touches in the Elimination Final loss to Port Adelaide. It was a terrific breakout year for the Queenslander in 2012. Put a pre-season shin complaint behind him to make a smooth transition into the midfield and did more than just settle there, ending the year as the competition’s leading disposal getter with 741. Signed a three-year contract extension in August, which was further justified when he was named All-Australian and then won his first Copeland Trophy. Was elevated to the leadership group in the second half of the season. A mixed season. Started well with 26 disposals and three goals against North Melbourne in round two, but was omitted after a quiet Anzac Day. Proved his worth against Geelong in the VFL in round seven, winning 32 disposals and kicking one goal. Returned in round nine but broke his foot a fortnight later against St Kilda and spent the next seven weeks in the grandstand. Hit form immediately against the Bombers in round 19 and had between 25-31 disposals in the next six matches. Went into the preliminary final against Hawthorn with groin soreness and paid the price, doing further damage and was eventually subbed off at three quarter time with only two handballs to his name. He stood down from the team ahead of the Grand Final as a result of the injury, upholding the legacy of Simon Prestigiacomo and putting the team ahead of himself. Named as an emergency for round one but returned in round two and didn’t miss a game from there on. Averaged 20.4 disposals and kicked 26 goals to run sixth in the Copeland Trophy, and walked away with a premiership medallion in only his second season. Struggled to convert in front of goal, notably late in the game against Hawthorn in round 22 (26.32 for the season). His form tapered in the last six weeks, but it didn’t detract from a brilliant season for such a young player. Kept the side in the game against Geelong in round nine when he kicked four of the team’s six goals. Received two Brownlow votes against Carlton in round 18. Showed promise in the NAB Cup but missed selection in round one. Was forced to drive up the highway from a VFL practice match at Kardinia Park to make a rushed debut the following week against Melbourne at the MCG when Dale Thomas was a late withdrawal. Beams looked right at home, winning 18 disposals and goaling for the first time. Played 18 games in his debut season, earned a Rising Star nomination in round 17 after the win over Carlton, and his performance peaked in round 20 when he had 30 disposals (and two Brownlow votes) against Richmond. He received maximum Brownlow votes the following week in the win over Sydney. Was sidelined from the Adelaide semi final with a calf strain but returned for the preliminary final. Played three matches in the VFL. Won the Harry Collier Trophy as Best First Year Player. Played for Southport in the QAFL. Represented Queensland at the U18 National Championships, where he averaged 24 disposals. Played three games for the Queensland Scorpions in the TAC Cup. Opted not to sign with his native Gold Coast ahead of their entry into the AFL in 2011 and instead tried his luck in the National Draft. 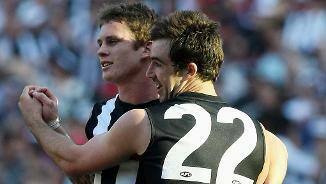 His decision was vindicated when Collingwood drafted him with selection 29. Admitted post-draft that he had always wanted to join Collingwood. Was the only Queenslander to attend the AFL Draft Camp. Made his senior debut for Southport aged 17. Was runner-up in the Southport U18 Best and Fairest. Represented Queensland at the state U16 carnival. Represented Queensland at the state U15 carnival. Represented Queensland at the state U12 carnival. Played his first season of football for Mudgeeraba, Queensland. Moved from Victoria to the Gold Coast.